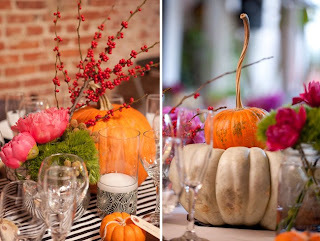 Dahlia's Day - The Wedding Talk Blog for the Practical Bride: Non-spooky Halloween Wedding Ideas! 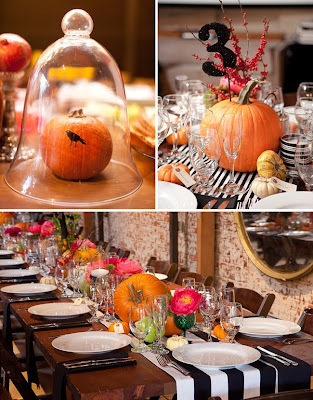 We may think a Halloween-themed wedding has to be all dark, sinister, and eerie. Not so! Just take a look at this warm and inviting take on this theme at a charming wedding I found on Green Wedding Shoes. Love it! The nod to Halloween comes through pumpkin and gourd accents, and fabulous fall florals. Then, see how cleverly the black-and-white striped runner and modern-design candle holders provide a chic contrast to all the rustic woodsiness...plus echo the darling black-and-white bow on the bride's dress (seen in the full post)! For another "cheerful" approach to a Halloween-themed wedding, see this lovely feature on The Sweetest Occasion. Just BOOtiful! Such great colors! I love Halloween! Bringing you what's unique and stylish in the wedding scene. You can email me at dahliady[at]gmail[dot]com for comments, blog rolling, and feedback. If I don't respond right away, it's not because I don't like you, it's because I'm swamped!